The Thread Management function group allows defining, creating, and controlling thread functions in the system. The function main is a special thread function that is started at system initialization and has the initial priority osPriorityNormal. RUNNING: The thread that is currently running is in the RUNNING state. Only one thread at a time can be in this state. READY: Threads which are ready to run are in the READY state. Once the RUNNING thread has terminated or is WAITING, the next READY thread with the highest priority becomes the RUNNING thread. WAITING: Threads that are waiting for an event to occur are in the WAITING state. INACTIVE: Threads that are not created or terminated are in the INACTIVE state. These threads typically consume no system resources. A thread is created using the function osThreadCreate. This puts the thread into the READY or RUNNING state (depending on the thread priority). CMSIS-RTOS is pre-emptive. The active thread with the highest priority becomes the RUNNING thread provided it does not wait for any event. The initial priority of a thread is defined with the osThreadDef but may be changed during execution using the function osThreadSetPriority. 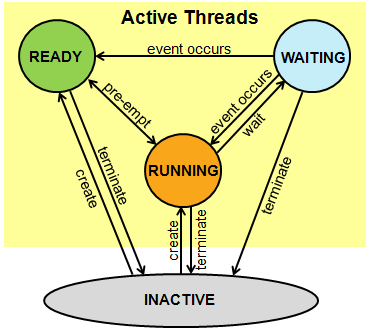 The RUNNING thread transfers into the WAITING state when it is waiting for an event. Active threads can be terminated any time using the function osThreadTerminate. Threads can terminate also by just returning from the thread function. Threads that are terminated are in the INACTIVE state and typically do not consume any dynamic memory resources. Access to the thread definition for the function osThreadCreate. name name of the thread definition object. CAN BE CHANGED: The parameter to osThread shall be consistent but the macro body is implementation specific in every CMSIS-RTOS. Define the attributes of a thread functions that can be created by the function osThreadCreate using osThread. The argument instances defines the number of times that osThreadCreate can be called for the same osThreadDef. name name of the thread function. priority initial priority of the thread function. instances number of possible thread instances. stacksz stack size (in bytes) requirements for the thread function. CAN BE CHANGED: The parameters to osThreadDef shall be consistent but the macro body is implementation specific in every CMSIS-RTOS. MUST REMAIN UNCHANGED: osPriority shall be consistent in every CMSIS-RTOS. Cannot be called from Interrupt Service Routines. The osPriority value specifies the priority for a thread. The default thread priority should be osPriorityNormal. If a Thread is active that has a higher priority than the currently executing thread, then a thread switch occurs immediately to execute the new task. To prevent from a priority inversion, a CMSIS-RTOS compliant OS may optionally implement a priority inheritance method. A priority inversion occurs when a high priority thread is waiting for a resource or event that is controlled by a thread with a lower priority. [in] thread_def thread definition referenced with osThread. [in] argument pointer that is passed to the thread function as start argument. MUST REMAIN UNCHANGED: osThreadCreate shall be consistent in every CMSIS-RTOS. Start a thread function by adding it to the Active Threads list and set it to state READY. The thread function receives the argument pointer as function argument when the function is started. When the priority of the created thread function is higher than the current RUNNING thread, the created thread function starts instantly and becomes the new RUNNING thread. MUST REMAIN UNCHANGED: osThreadGetId shall be consistent in every CMSIS-RTOS. Must not be used inside the idle daemon. This would lead to undefined behavior. [in] thread_id thread ID obtained by osThreadCreate or osThreadGetId. MUST REMAIN UNCHANGED: osThreadGetPriority shall be consistent in every CMSIS-RTOS. Get the priority of an active thread. In case of a failure the value osPriorityError is returned. [in] priority new priority value for the thread function. MUST REMAIN UNCHANGED: osThreadSetPriority shall be consistent in every CMSIS-RTOS. Change the priority of an active thread. osOK: the priority of the specified thread has been successfully changed. osErrorResource: thread_id refers to a thread that is not an active thread. osErrorISR: osThreadSetPriority cannot be called from interrupt service routines. MUST REMAIN UNCHANGED: osThreadTerminate shall be consistent in every CMSIS-RTOS. Remove the thread function from the active thread list. If the thread is currently RUNNING the execution will stop. In case that osThreadTerminate terminates the currently running task, the function never returns and other threads that are in the READY state are started. osOK: the specified thread has been successfully terminated. osErrorISR: osThreadTerminate cannot be called from interrupt service routines. Avoid calling the function with a thread_id that does not exist or has been terminated already. MUST REMAIN UNCHANGED: osThreadYield shall be consistent in every CMSIS-RTOS. Pass control to the next thread that is in state READY. If there is no other thread in the state READY, the current thread continues execution and no thread switching occurs. osOK: the function has been correctly executed. osErrorISR: osThreadYield cannot be called from interrupt service routines.